Tungsten Carbide Rings, although a still fairly new metal, has been gaining popularity over traditional metals for the past 8 years. Tungsten Carbide was originally manufactured with men that worked with their hands, those who worked in industries such as farming, construction, home building, welding and concrete work. The men that worked in these industries ran the risk of damaging their ring with rough terrain, easily being scratched and ruined, never to be brought back to the original beautiful luster. Tungsten was desirable to men for the ultimate scratch resistance and heaviness that came with wearing a masculine ring. Tungsten allows men to wear their wedding bands while working without the fear of surface damage or a scratched up, faded ring. When manufacturers started selling tungsten wedding bands the styles that were available were very limited. The retail stores only sold simple, basic styles that were found everywhere and typically at a high price point to buy a simple band. With increasing demand manufacturers started selling more unique styles at prices most couple could afford through company websites. These styles included lasered engraved styles, carved tungsten, unique inlays and colored tungsten carbide. Brief descriptions of the styles are listed below. 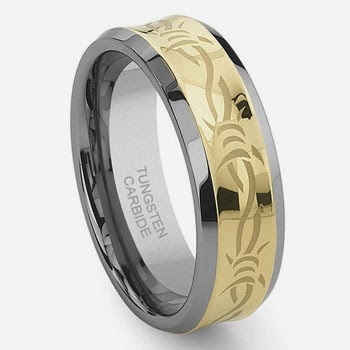 Lasered Engraved Tungsten Carbide: Laser engraving adds a creative flair to a basic band. Laser engraved rings can come in endless style possibilities and many customers can even choose their engraving to add a personalized touch to the ring. Popular laser engravings include special phrases, Knot work patterns, the symbolic Claddagh pattern, company logos and team names. 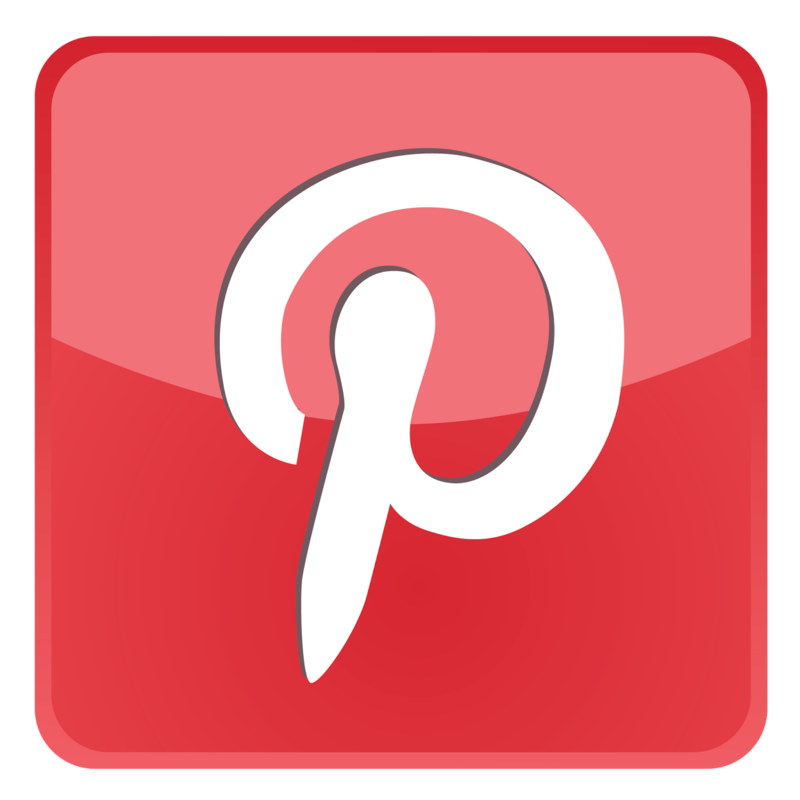 Laser engraving can be placed on any polished ring regardless of shape, width or size. 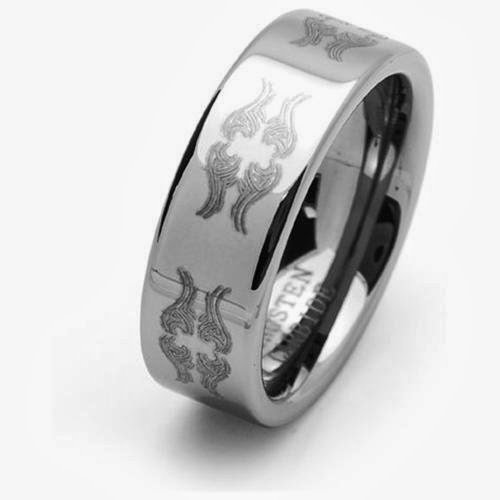 Laser engraving is also commonly placed on colored tungsten as a truly fashionable ring. Colored Tungsten Carbide Rings: Colored tungsten commonly consists of black, gold and chocolate. Tungsten metal cannot ever change color so the coloring is always plating on the surface of a standard tungsten band. The coloring can either be in a high polished or matte, brushed finish to accommodate the style wishes of customers. 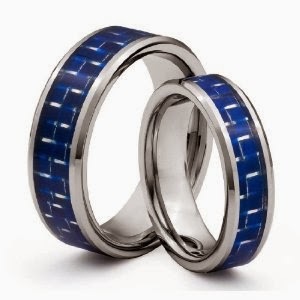 Colored tungsten is typically recommended for fashion purposes only as the coloring can slowly fade and scratch over time just as any plated ring would. 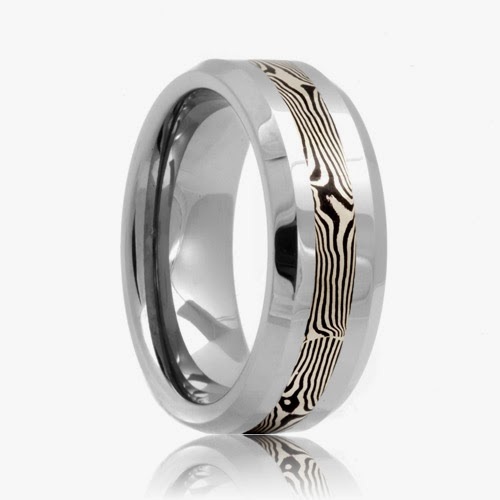 Carved Tungsten Wedding Bands: Carved tungsten is still fairly new to the jewelry industry as many suppliers still do not have the technology to carve into such a hard, dense metal. Carved tungsten is similar to laser engraving except the design is carved deep into the metal creating a design that will only look better with age. Popular carved designs include simple knot patterns, Greek heritage rings, simple phrases or dates and crosses. Carved tungsten typically comes at a slightly higher price point due to the extensive labor that goes into creating just one ring style. 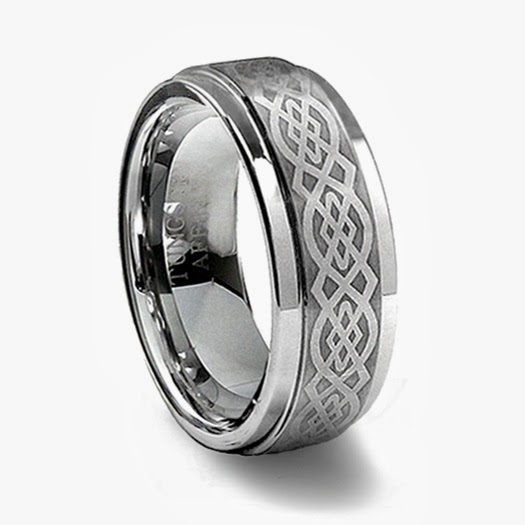 Unique and Beautiful Inlays: Inlays add a creative flair to tungsten rings that many couples want to wear. Unique inlays paired with tungsten include colorful abalone shell, genuine wood inlays coming in redwood and ebony wood, black and white carbon fiber inlays and durable ceramic inlays in traditional colors. Inlays have always been popular as customers want the durability of tungsten while having a fun ring to wear as their forever piece.